Celebrate Always: My 3 Year Old! 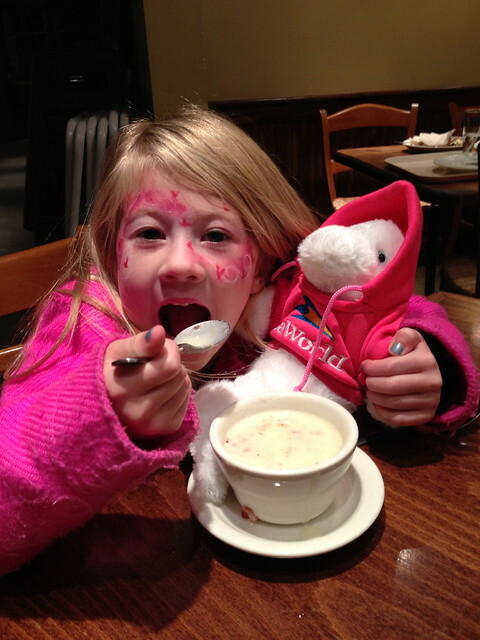 We did McKenna's birthday party a few days before her actual birthday so I had a little special treat on January 3rd. I woke McKenna up singing Happy Birthday. I had to sing three times before she got up. 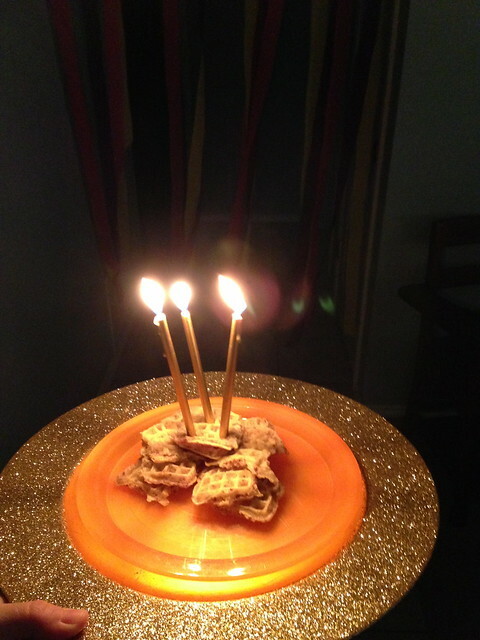 She requested little waffles for her bday breakfast. 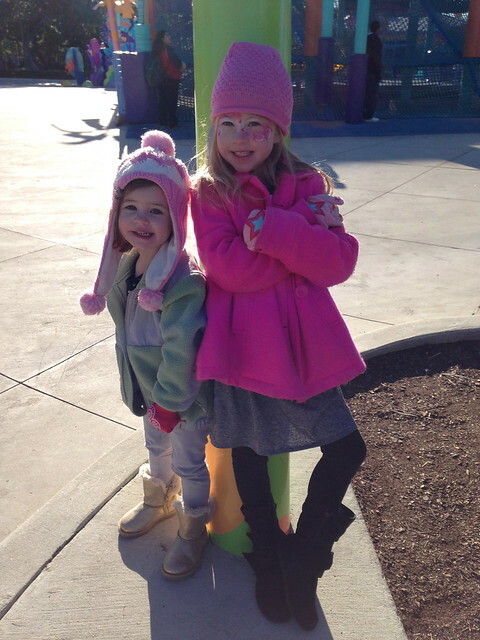 We ate and then I told the girls to bundle up and get in the car. They were dying to know where we were headed but I wouldn't say. They had lots of guesses but I knew they would never guess it. 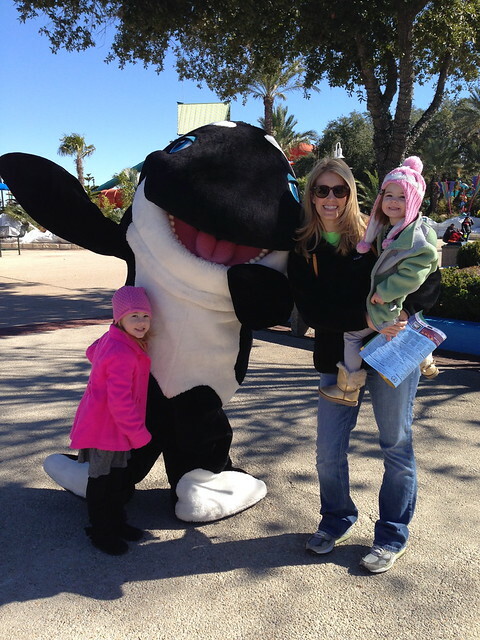 I was taking them on a day trip to Sea World! We had season passes that expired on the 5th so it was perfect timing. Only bummer was that Bob was working so it would just be the girls and I. It ended up being the best trip and such a special time with just us girls. Once we pulled up, they couldn't believe it! We got there before it even opened so we were one of the first ones in. We saw every show and rode all the rides. It was a dream! It wasn't very crowded at all so we never had a long wait for anything. Ella was my brave girl that rode the big kids rides all by herself! I would usually go with her but since it was just us, I couldn't leave McKenna. The roller coaster was her favorite. 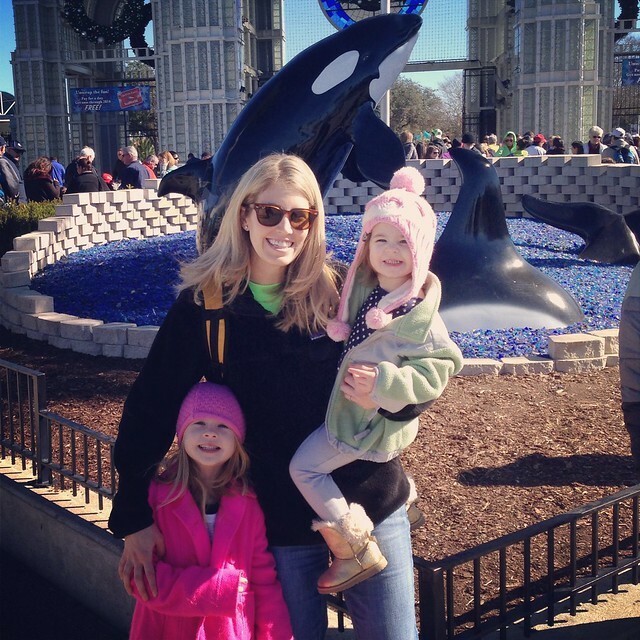 She had already ridden it twice and as we were leaving the park and it was 10 minutes until Sea World closed, Ella says to me, I wish I could ride that roller coaster one more time. So we turned around and went to ride it one last time. 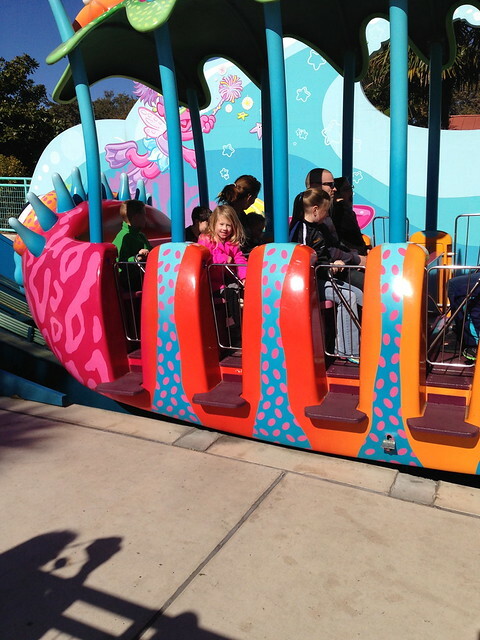 There was nobody in line so she rode that thing all by herself! Love that kid. 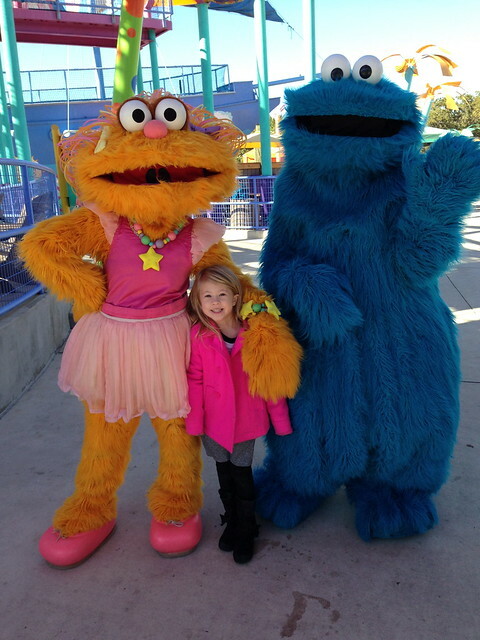 McKenna loved the shows but wanted nothing to do with getting her picture made with them. 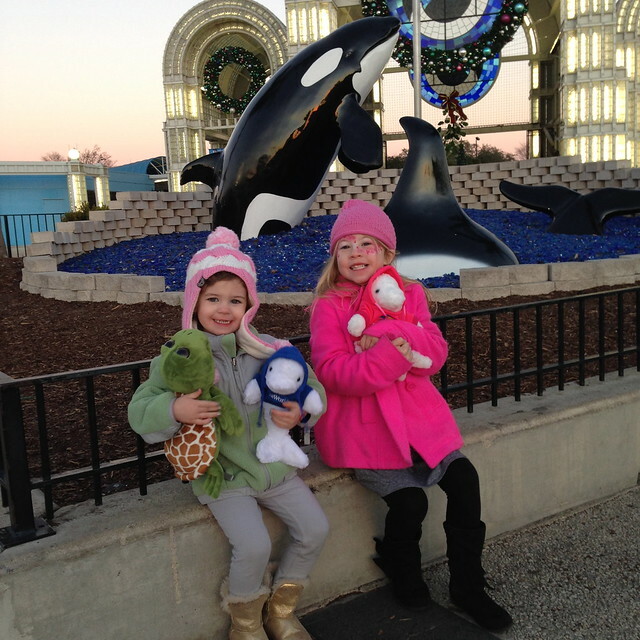 I loaded the girls up with souvenirs (thats maybe the one plus to not having Bob with us) and they were in heaven. We stopped in Austin on our way home for a very late dinner. It was past 9pm at this point and I can't believe the girls were still up and happy. 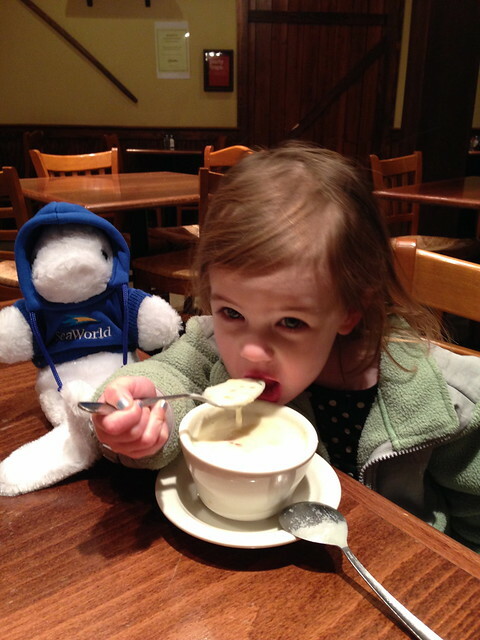 We love potato soup at La Madeleine. It was a long fun filled day and I wouldn't have wanted to do it with anyone else! I love my girls so so much. 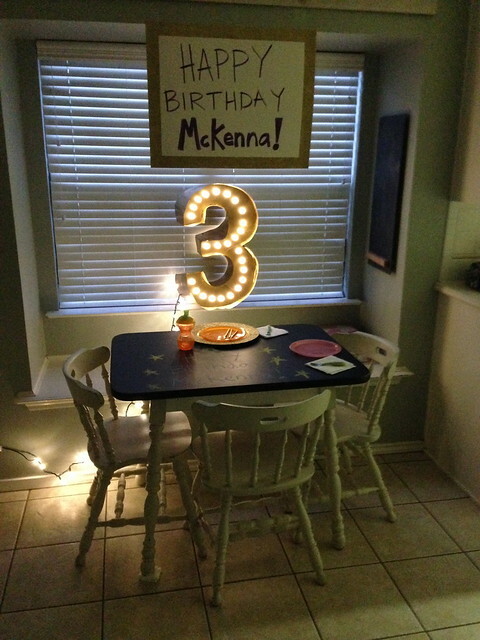 I still can't believe McKenna is 3 years old. If I could stop time, I would do it now. She is in such a joyous and funny stage and I love the way she does and says everything. 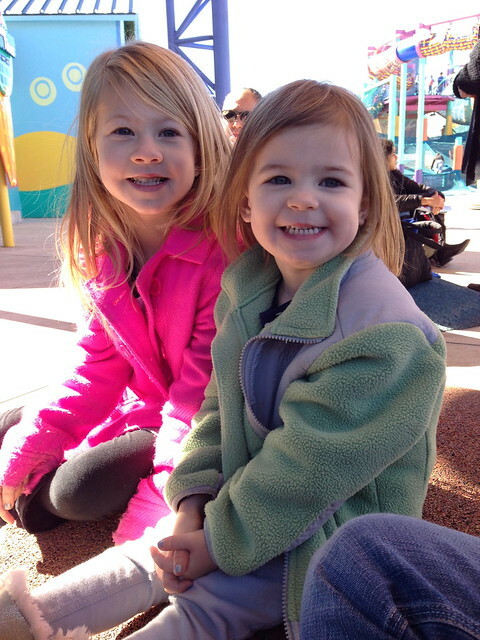 She is such a happy child and loves her big sister more than anything. Her little voice having conversations with Ella melts my heart. I wish every moment and conversation was recorded so I would never forget. She is so caring and sweet. If I ever cough or sneeze, she will ask if I am ok. Even if I cough 5 times. She will say "You ok mom?" after every single cough. The way she pats her pillow and asks in the sweetest voice if I want to lay down with her, gets me every time. 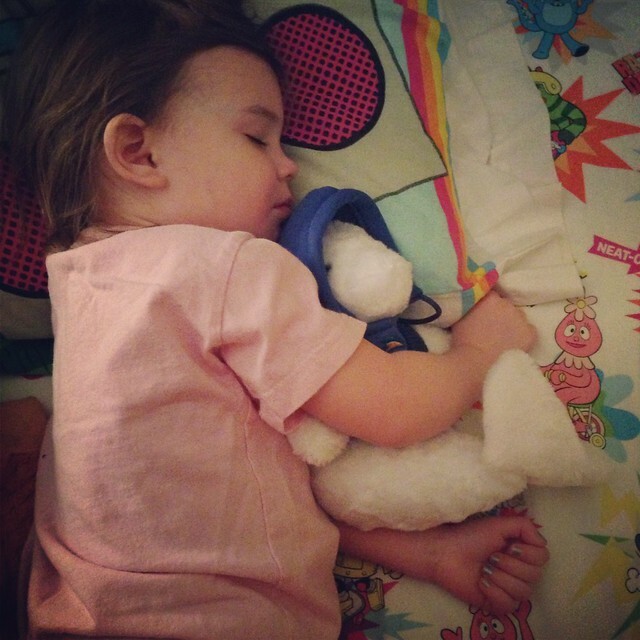 The way she talks to her baby dolls and kisses their cheek makes me cry. The way she reacts when Ella accidentally hits her in the head with a basketball makes me laugh so hard I pee in my pants. McKenna has a special way about her. I don't even know how to explain it but it's something that lights up my soul. I love this girl. Happy Birthday my sweet McKenna. I just lover very single thing about this post. These are the sweetest memories. Precious McKenna, you are such a joy. If we can't freeze time, we will just get excited about how sweet and fun and caring and adoring you will always be. We love you so, so much sweet angel. Lordy, we must have the same sense of humor bc when I read the line about the basketball to the head, I cried from laughing!!! Phewww. I have a little 2 1/2 year old boy, and everything you said about freezing time, I was JUST thinking today. I grab my phone to record him 100x a day, bc his voice and word pronunciation are just SO darling. What an awesome birthday party and post!!! Oh McKenna! I wish we lived in the same town because I just want to squeeze her! I love her little bottom teeth smile! That picture of her asleep is the sweetest - the painted nails, and just knowing what a fun day y'all had. I feel like I over-use the word precious, but she is PRECIOUS.